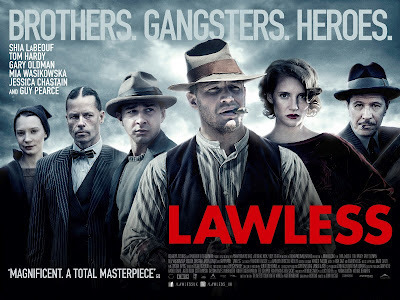 LAWLESS is the kind of movie you could watch in an imaginary art-house theatre where the only seat is a Chesterfield sofa in the middle of the room, and you're curled up with a bottle of Bourbon and an Opus X cigar. It contains scenes of sickening violence; ethereal cinematography;an immersive, at times overwhelming sound-scape; and a disturbing, provocative moral ambiguity. Set in Prohibition era Virginia, LAWLESS is the tale of the three Bondurant brothers - bootleggers holding out against a corrupt lawman, and dangerously believing the myth of their own invincibility. Gruff, inarticulate older brother Forrest (Tom Hardy) is at once a faintly comic goon and a frighteningly violent dispenser of justice, as he sees it. Middle brother Howard (Jason Clarke) is a largely silent, forgotten (and fatefully forgetful) middleman. Younger brother Jack (Shia LaBeouf) is the vain, starry-eyed, romantic fool who's wooing of the preacher's daughter ultimately sets in motion the final showdown between the brothers and the "Law", Charlie Rakes (Guy Pearce). Tom Hardy is mesmerising as Forrest - walking a fine line between fearsome and funny - and killing a final scene where he has to question his own myth. But this movie belongs to Guy Pearce in the same way that NO COUNTRY FOR OLD MEN belongs to Javier Bardem. He plays perhaps the most chilling, disturbing dandy killer since Brother Mouzone of The Wire, with brilliantly conceived make-up - a slightly too wide parting, slightly too thin eyebrows - unsettling us from the start. Ultimately, the rest of the movie is pretty thinly conceived. Poor brother Howard has nothing much to do. The female roles are underwritten. Gary Oldman - playing a Chicago mobster - is criminally underused, although he does have one tremendous scene with Noah Taylor. The plot, when you really think about it, is pretty thin too. The boys refuse to pay off the corrupt Rakes. He tries to terrify them into submission. They refuse. It comes to a showdown. But I guess I just think all that is beside the point. The movie is both lyrical and hard-boiled. It's all about the battle between Forrest and Rakes - and their personalities dominate the screen. It's about the atmosphere of that time enveloping us - Benoit Delhomme's beautiful photography of landscapes shrouded in mist, and interiors cast in shadow. It's about being immersed with Jack in the overwhelming sound of the religious meeting to the point of being sick. It's about the uneasy feeling that even in lighthearted moments, sickening violence is always a possibility. It's about being complicit in the violence - cheering on the boys, as the poster suggests, as "heroes", but knowing that Forrest has done some truly repulsive things. More than that, the film is - like BUTCH CASSIDY AND THE SUNDANCE KID - or THE ASSASSINATION OF JESSE JAMES BY THE COWARD ROBERT FORD - about myth, and the dangers of believing in your own press. Early on Forrest tells Jack that the only thing that keeps the brothers safe is the myth of their invincibility. But this myth is subversive. Poor Jack and his sidekick collect shell casings to make necklaces and take photos of each other posing with guns. Forrest's belief in his own invincibility is used against him by his lover. And Rakes is infuriated by that myth. Far from glorifying the violent Forrest, in the end he is a figure of hapless incompetence and comedy. So much for the hero. LAWLESS played Cannes 2012 and is on release in Canada and the USA. It opens this weekend in Bulgaria, Finland, Ireland, Norway and the UK. It opens next weekend in France, Hungary, Slovenia, Spain and Sweden. It opens on September 20th in Belgium, the Czech Republic, Greece, Brazil and Iceland. It opens on October 4th in Russia; October 11th in Australia and Denmark; October 18th in Portugal and South Korea; October 25th in Argentina and Turkey; November 15th in the Netherlands; November 30th in Poland and on February 7th 2013 in New Zealand.